You are a knight in the king's army, and you've been tasked with constructing some walls. The problem is, as a knight, you are confined in your movement abilities. But, when the king orders you to do something, you'll have to figure out a way to do it. The top left 3, the bottom left 4, and the top right pair of sixes. I tried connecting the top left and top right a few different ways with trial and error, and came to the conclusion it was impossible. 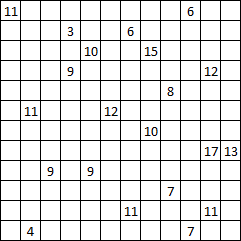 From this conclusion I started working on solving the 6-area at the top right, because I had to work around a fair amount of filled squares, knowing I needed to head down rather than left. Doing some counting, I was clearly missing something in the bottom right, fortunately I saw a cycle which could be safely added. A little more counting let me verify that these were basically right, shade them to black and white, and put the last one to the right of the central 12 to link the top and bottom halves of the left side leading to the graph at the top of this post. Not the answer you're looking for? Browse other questions tagged grid-deduction knight-moves or ask your own question.